Rather epic in length, The Force of Destiny (La forza del destino) is all too rarely seen on Australian stages, so its inclusion, as part of Opera Australia’s celebration of the bicentenary of Verdi’s birth, is most welcome. Verdi’s famous overture sets the ponderous, mysterious tone, with the music complemented by a performance in which the lead characters foreshadow the ensuing drama. Already, the preponderance of skulls hints to a destiny not all together fortuitous. 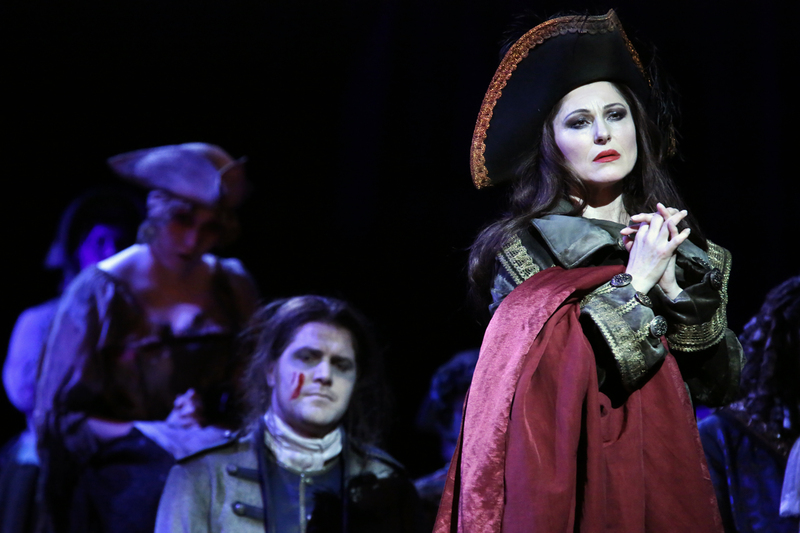 Rinat Shaham, appearing as though she has come directly from her previous triumph as Carmen, is central to the moody atmosphere as the gypsy Preziosilla. Essentially a minor role, Preziosilla’s importance has been expanded to have her omnipresent, giving the force of destiny a helping hand at crucial moments. In superb voice, Shaham’s magnetic presence and strong, committed acting makes this device work to brilliant effect, her laughter at the devastation wreaked by fate being particularly chilling. Director Tama Matheson plays the somewhat convoluted storyline completely straight, allowing the dramatically charged plot to unfold in sinister fashion. The large cast are used to striking effect in making full use of the space, creating interesting, textured images throughout the seven scenes of the four act opera. Mark Thompson’s designs feature richly extravagant period costumes, which are ornate but darkly layered to suit the foreboding mood. Delineation of characters is very strong, which is helpful given that eight of the eleven leads are male. One odd choice is to have the men in Uncle Fester make up; this looks particularly out of place on our hero Don Alvaro. 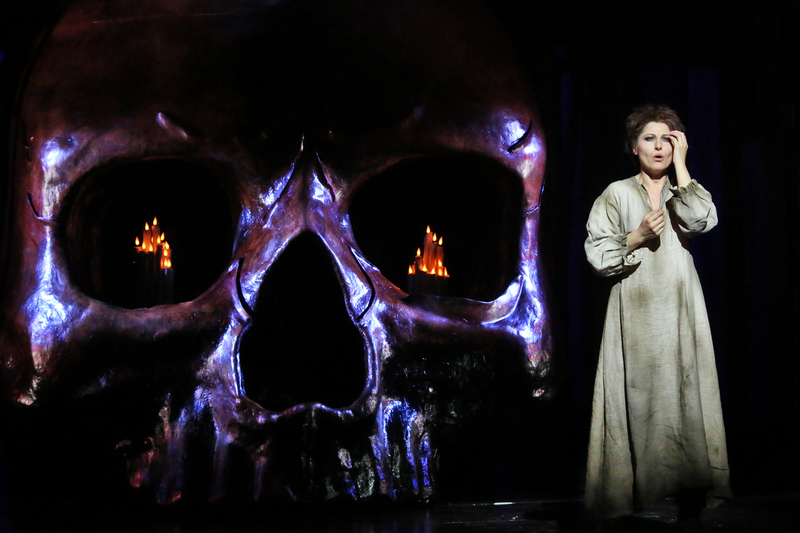 Thompson’s scenic design centres on a glossy giant skull, which is an inspired choice. The wooden staircases on wheels, however, seem straight out of a school production, and looked ludicrous in the opening scene in the Marchese’ mansion. Religious icons make a striking statement, particularly in the unsettling final image. The darkly brooding tone is greatly enhanced by Nigel Leving’s highly atmospheric lighting. 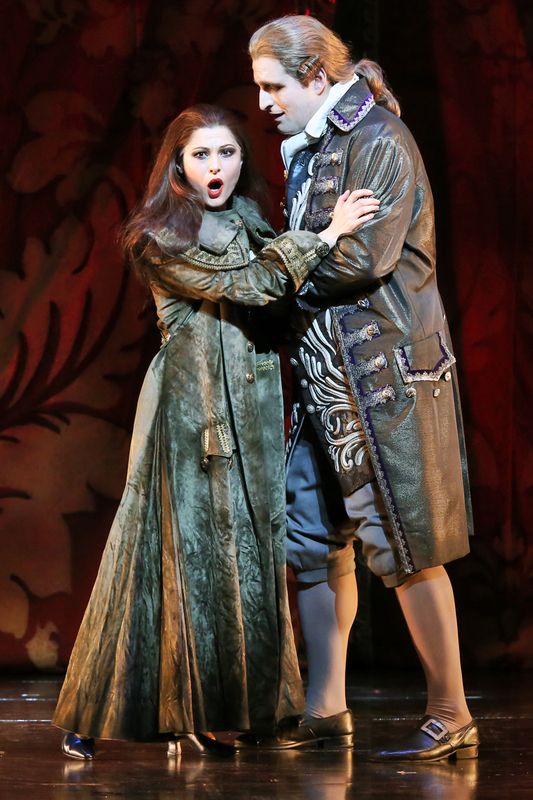 Leading the principal cast is exquisite Bulgarian soprano Svetla Vassileva as Leonora. Performing the intimate aria “Me pellegrina ed orfana” as she undresses in act one, Vassileva garners the audience’s affection and leaves them wanting more all night. Act two’s “Sono giunta…grazie O Dio,” sung in front of a giant statue of Mary, is similarly gorgeous. 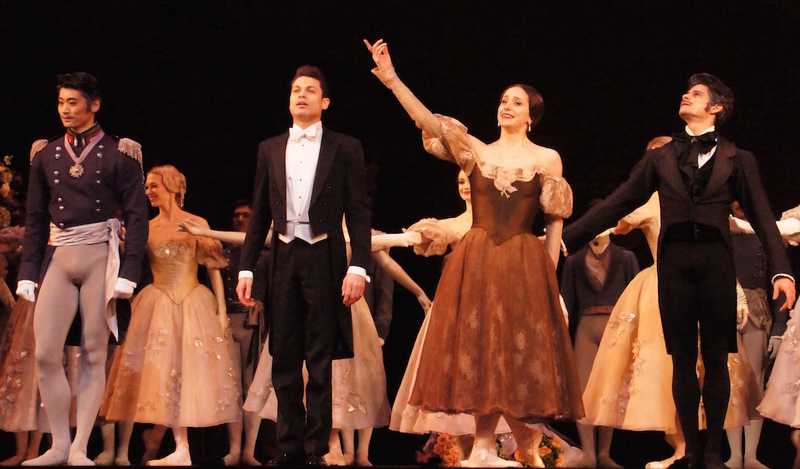 Vassileva’s presence is noticeably missed in act three before she returns for a final triumph at the end of act four. Future performances from Vassileva are eagerly anticipated. 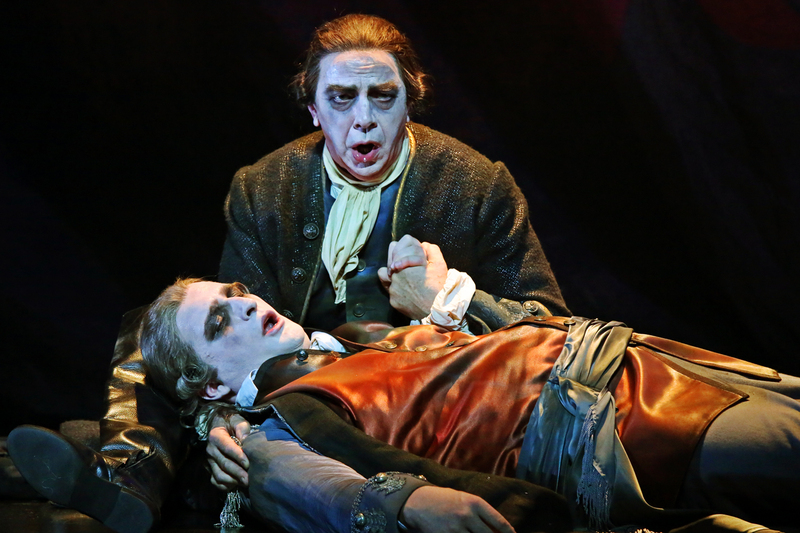 The production is blessed by a range of strong male voices, particularly baritones Joanthan Summers, as the insanely vengeful Don Carlo, and Warwick Fyfe as Fra Melitone. Summers’ twin arias “Morir! Tremenda cosa” and “Urna fatale del mio destino” in act three are superb. 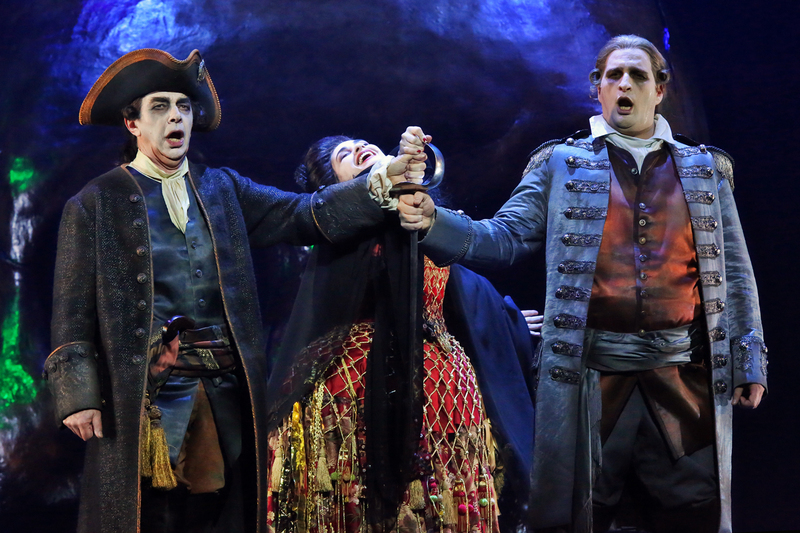 Visiting Italian tenor Riccardo Massi initially seems somewhat outclassed, but more than comes into his own in act three with the stirring “La vita é inferno,” finishing powerfully in act four as well. Giacomo Prestia impresses as Padre Guardino, and fellow bass Richard Anderson stands out in a cameo as the Marchese. Invaluable company member Kanen Breen achieves yet another unique characterization as the peddler Trabuco, Breen’s pure tenor voice being a luxury in this all too brief role. 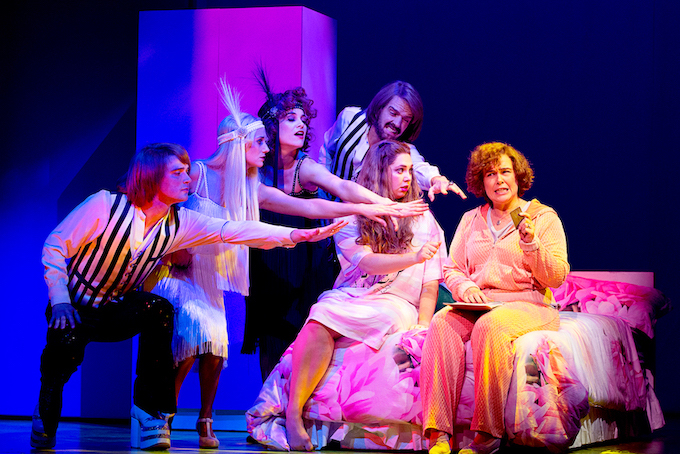 The Force of Destiny continues at Joan Sutherland Theatre, Sydney Opera House until 23 July 2013. 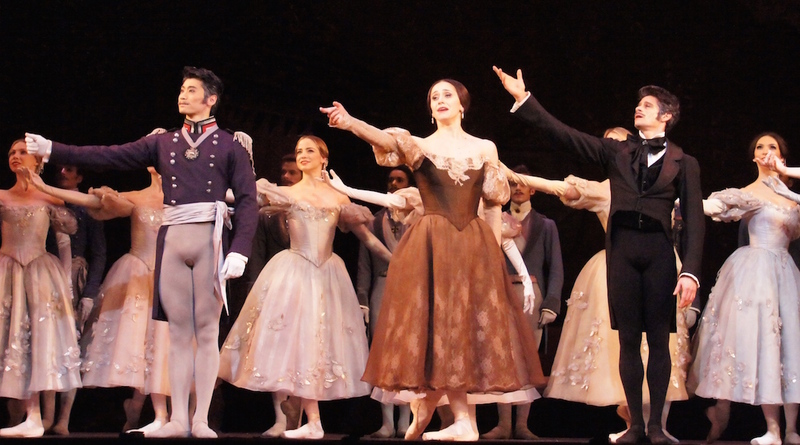 This review is based on the performance on 10 July 2013.